Motorola announced the availability of MOTO Q q9 and MOTO Q gsm. Delivering power, style and ease-of-use, MOTO Q q9 and MOTO Q gsm continue to evolve the mobile office experience by bringing an opportunity to own an iconic, power packed smart phone to virtually every user around the world. MOTO Q q9 offers pure performance through design, delivering more power, richer messaging and multimedia experiences and even better basics for the most demanding consumers and professionals. Operating on the next generation Microsoft Windows Mobile 6 platform and with Motorola’s Good Mobile Messaging technology, MOTO Q q9 provides easy and intuitive personal and corporate email, calendar access and content management wherever you are. HSDPA connectivity makes listening to music, watching videos or sharing pictures lightning fast and Windows Mobile “PlaysForSure” enables compatibility with music and video stores worldwide. A convenient side-load removable micro-SD card compliments MOTO Q q9’s 256MG of onboard memory to ensure users have plenty of room to store what’s most important. The second handset built on Motorola’s SCPL platform, MOTO Q q9 is optimized by design. It’s thin, lightweight, sophisticated frame includes an ergonomically-optimized keyboard and five-way navigation key to enable fast, accurate text entry. MOTO Q q9 also boasts one of the world’s smartest screen displays, automatically adjusting to produce the best visual experience, indoor or out. With battery design that has been optimised for superior performance and USB 2.0 for full speed PC connectivity, Motorola is once again redefining what consumers should expect from a QWERTY device. Retaining all the productivity features and style of the original CDMA-based MOTO Q while adding new enhancements, MOTO Q gsm is set to make an impact in markets across the globe. MOTO Q gsm features quad-band GPRS and EDGE capabilities to deliver worldwide connectivity, Microsoft Windows Mobile 6 software for flexibility and power, and a full suite of multimedia and messaging options to keep you entertained. Based on the much-imitated Q design, the thin, lightweight MOTO Q gsm showcases a soft-touch metal casing, electro-luminescent keys, gorgeous full color screen and ergonomically optimized QWERTY keyboard and side thumb wheel to deliver no-compromises email and messaging. The MOTO Q family also makes good business sense for enterprises big and small by leveraging Microsoft’s trusted Windows Mobile Platform, Motorola’s Good Mobile Messaging technology and a variety of third party email solutions. Both MOTO Q q9 and MOTO Q gsm are also fully customisable, with over 300 applications optimised for Motorola and a full suite of accessories. 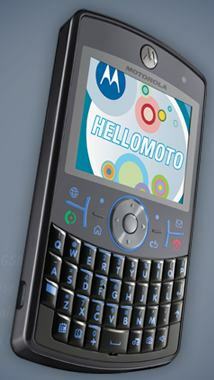 MOTO Q q9 will be available in Q2 2007. MOTO Q gsm will be available in the second half of 2007.